LONG BEACH — The 25th anniversary of redress was commemorated at the JACL Pacific Southwest District Awards Luncheon on Sept. 21 at The Grand in Long Beach. Signed into law on Aug. 10, 1988 by President Ronald Reagan, the Civil Liberties Act provided individual payments of $20,000 and an official apology to Japanese Americans who were deprived of their constitutional rights during World War II. The purpose of this year’s luncheon was to recognize district leaders who played an important role in the redress campaign. 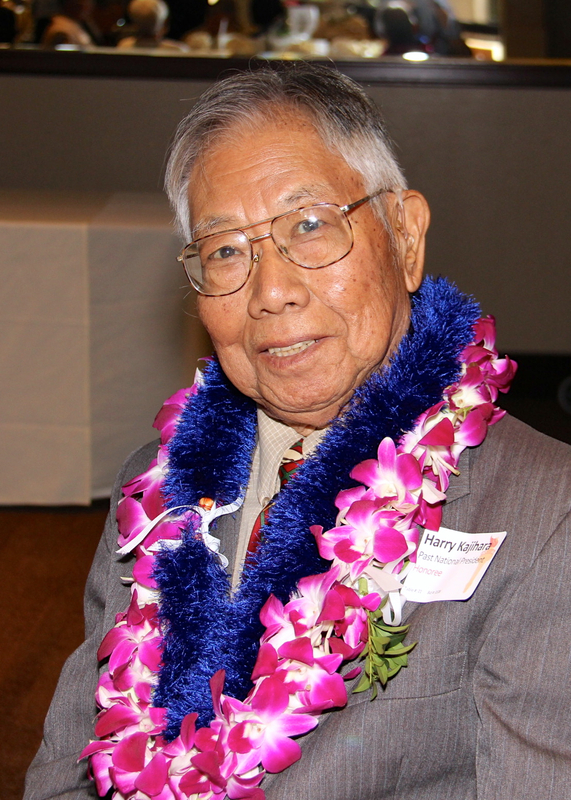 • Harry Kajihara, who served as Ventura Chapter president, PSW redress chair, and national fundraising chair for JACL’s lobbying arm, the Legislative Education Committee (LEC). He took great satisfaction in exceeding the fundraising goals set by each group and being National JACL president when the Civil Liberties Act of 1988 was enacted. The signing ceremony was held in Washington, D.C. during the JACL National Convention in Seattle, but Kajihara was able to attend and can be seen in photos of the ceremony with Reagan and members of Congress. The award was presented by outgoing PSW District Governor Ken Inouye. 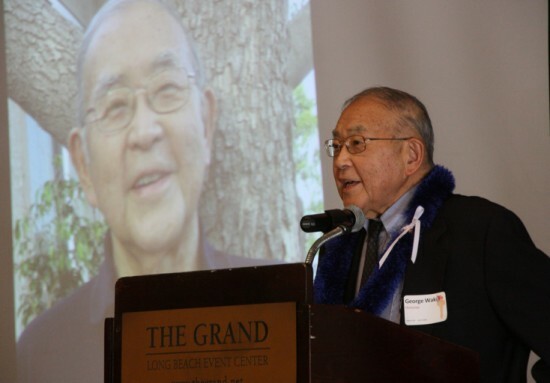 • Harry Kawahara, who has served as vice governor and board member of the PSW District Council, a member of the Ethnic Concerns Committee and the National JACL Education Committee, and founding president of the Greater Pasadena Area Chapter. When the Commission on Wartime Relocation and Internment of Civilians (CWRIC) held public hearings in Los Angeles in 1981, Kawahara played a pivotal role in recruiting and preparing witnesses. It was moving and cathartic experience for former internees to openly express their feelings after years of silence. The award was presented by David Kawamoto, former National JACL president and the new PSW governor. • Phil Shigekuni, who co-organized the first Southern California redress panel as San Fernando Valley Chapter president in 1975; co-founded a redress organization, EO 9066 Inc., which conducted surveys showing strong community support for redress; served on the JACL National Redress Committee; and co-sponsored the first Day of Remembrance in Little Tokyo in 1978. He also prepared testifiers for the Los Angeles hearings of the CWRIC, whose findings and recommendations became the basis for the redress bill. The award was presented by San Fernando JACL President Brian Moriguchi. • George Wakiji, who has been a member of JACL for close to 50 years, including the chapter in his native Pasadena. He served as president of the Ventura County Chapter and spoken extensively about his internment at Santa Anita and Gila River during World War II, representing the speakers’ bureau of the Chicago, Washington, D.C. and Ventura County chapters. In 1976, he helped convince President Gerald Ford to rescind Executive Order 9066, which President Franklin Roosevelt had signed in 1942. Wakiji was also the first executive director of the National Japanese American Memorial Foundation, which was responsible for building the Japanese American Memorial to Patriotism During World War II in Washington, D.C. The award was presented by Doug Urata, who co-emceed the event with Linda Hara. • Joseph Allman (Arizona), former president of his chapter, who lobbied for redress, coordinated workshops with the Office of Redress Administration, conducted teacher workshops, and co-chaired the Gila River Monument and Reunion project. • Mas Inoshita (Arizona), former chapter president, who traveled to Washington, D.C., to testify for redress, and has been instrumental in maintaining the Gila River Monument site. • The late Sue Kunitomi Embrey (Marina SCAN), who co-founded the Manzanar Committee, organized the Manzanar Pilgrimage, and was instrumental in Manzanar’s designation as a State Historic Landmark and National Historic Landmark. • Jun Fukushima (SELANOCO), a charter member of his chapter, who participated in the CWRIC’s Los Angeles hearings. • The late Hiroshi Kamei, a long-time leader of the Japanese American community of Orange County who campaigned for redress. • The late Clarence Nishizu (SELANOCO), who lobbied members of Congress, particularly fellow Republicans, on behalf of the redress bill and witnessed the signing ceremony. • Marleen Kawahara (San Diego), who served as redress chair for her chapter and the Pacific Southwest District, and attended the signing of the Civil Liberties Act. • Gary Mayeda (APAN), who was a leader in the Campaign for Justice, which fought on behalf of Japanese Latin Americans who were excluded from the redress bill. • The late Meriko Mori (Greater L.A. Singles), a charter member and past president of her chapter, who worked on redress and witnessed the signing of the bill. • Kitty Sankey, (Greater L.A. Singles), a past chapter president who lobbied in Washington, D.C. , and helped produce a musical tape to educate the public about the camps. • Patty Sookdet (Downtown L.A.), a chapter board member who is responsible for the 9th Street Elementary School Scholarship. 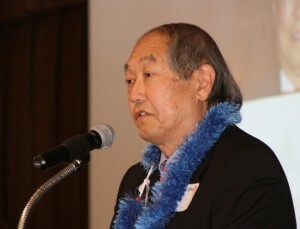 The keynote speaker was Grant Ujifusa, founding editor of “The Almanac of American Politics.” At the request of Min Yasui and Mike Masaoka, he became the legislative strategy chair of JACL’s LEC in the 1980s. In his speech, Ujifusa discussed how he devised a strategy for redress that would appeal to both liberals and conservatives, and lobbied key elements of the strategy in Congress and at the White House — at a time when many believed that Congress wouldn’t pass the bill, and if passed, Reagan wouldn’t sign it. Ujifusa thanked key figures in the redress campaign who have passed away, including Masaoka, Cherry Kinoshita of Seattle, Rep. Robert Matsui, Sen. Spark Matsunaga, Sen. Daniel Inouye, and Kaz Masuda, who was killed in action while serving with the 442nd Regimental Combat Team but was refused burial in his hometown, Fountain Valley, because of his ancestry. Ujifusa noted that Masuda’s sister, June Masuda Goto, urged Reagan to sign the bill, reminding him that as an Army captain in 1945, he spoke at a ceremony posthumously awarding the Distinguished Service Cross to her brother. The Governor’s Award went to Amy Tambara of Downtown L.A. Chapter for heading the JACL Holiday Cheer campaign every year; and to Urata, JACL Health Benefits Insurance Program representative, past PSW board member and past Riverside JACL president. The Community Award was presented to Southern California Edison for supporting the Collegiate Asian Pacific Internship. 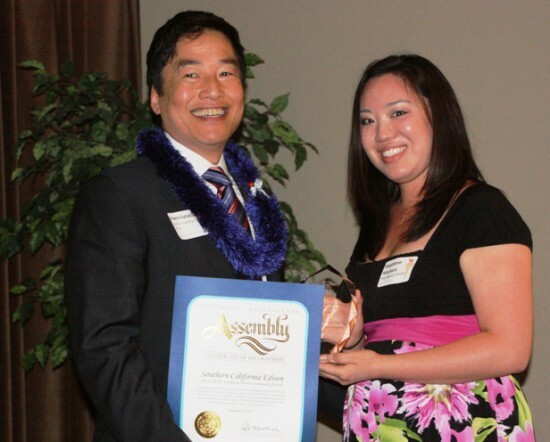 Accepting on behalf of SCE was Erwin Furukawa, senior vice president of customer service. SCE also received a commendation from Assemblymember Al Muratsuchi (D-Torrance). A video about NCRR — originally National Coalition for Redress/Reparations, now known as Nikkei for Civil Rights and Redress — was shown. NCRR has worked with PSW JACL on such projects as Bridging Communities, which brings together Japanese American and Muslim American youth. The program paid tribute to John Saito Sr. and Harry Honda, who passed away in October 2012 and last July, respectively. Saito was PSW regional director at a time when the redress campaign was gaining traction in Southern California; Honda was with JACL’s newspaper, Pacific Citizen, for 50 years, including 30 as editor. Other speakers included JACL National President David Lin, PSW Regional Director Stephanie Nitahara, PSW Program Coordinator Traci Ishigo, and PSW Vice Governor Carol Kawamoto, who served as luncheon chair.